Image source: Sandra Plummer Collection, Fort Worth Library Digital Collections. High school history textbooks only have passing references to events that transpired during the Philippine-American War that the average Filipino will likely have vague recollections of what transpired, if at all. This article intends to remedy this, albeit the information is extracted from obscure and forgotten American documents which, but naturally, tell the story from the American point of view. Herewith, therefore, are snippets of American military operations taken from the annual report of the United States War Department for the fiscal year ending June 30, 19021. The snippets are part of a section summarizing military operations in the Philippine Islands. However, for the purposes of this web site, we only extract those pertaining to the Province of Batangas. 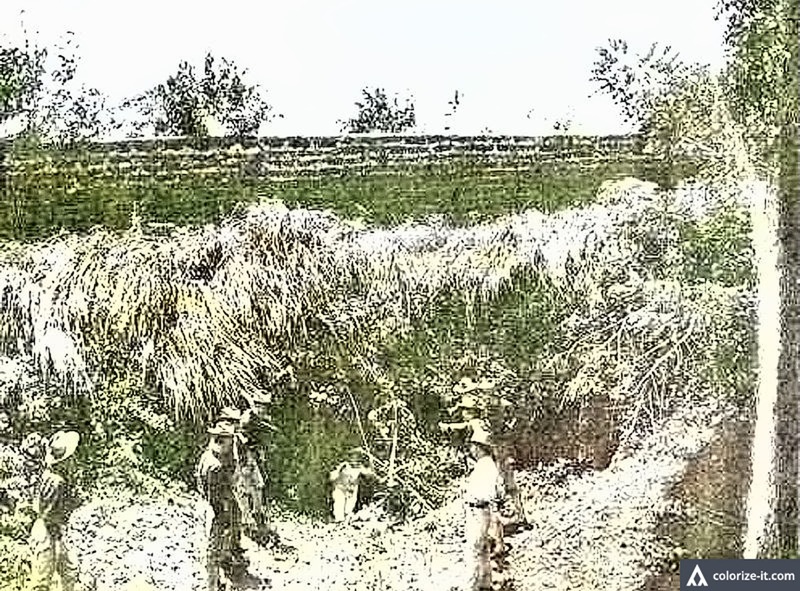 At San Juan de Bocboc, one Lt. Ferilo Reyta along with one sergeant, one corporal and three men surrendered to the Americans, bringing with them 4 German-made rifles, 1 Mauser2 and 1 Krag3 rifle. 50 Filipinos were killed and many more wounded after during two days of fighting with an American command under one Captain William S. McNair of the 31st Coast Artillery. This event was reported by one Colonel Almond B. Wells of the First Cavalry from the town of Batangas. In the town of San Jose, in the barrio of Aya, a tax collector for the Filipino rebels were captured by a detachment from the 21st Infantry led by 1st Lt. Patrick A. Connolly. The collector had in his possession one beef cattle and one pony. The detachment destroyed a storehouse that contained 4,000 pounds of rice grains. In the town of Bauan, in the vicinity of a place called Balata [This is unreliable and many American documents of the era included the names of places transcribed as American servicemen heard them.] the First Cavalry under one Captain John D. L. Hartman captured a total of 168 suspected rebels from among the natives. These natives would be closely scrutinized to determine who among them were members of the “insurgency” movement, as the Americans called the Filipino freedom fighters. 1st Lt. William M. Fassett of the 21st Infantry sailed to Isla Verda from the town of Batangas with 40 men in pursuit of Filipino rebels. Fassett’s detachment being 12 hours late, the rebels were no longer in the island. The Americans sailed on to Calupan (presumably Calapan) in Mindoro, attacking early in the morning and killing 12 Filipino rebels. Eight were also captured and, with them, 6 rifles, 3,000 rounds of ammunition and one box of papers. Two American soldiers were also rescued. A Coast Artillery detachment led by 1st Lt. William S. McNair, captured rebels in the town of Taysan, which the detachment had been previously scouting. Taken were a rebel lieutenant, 9 of his men along with 2 rifles and 2 revolvers. A detachment from Bauan under the command of Captain John D. L. Hartman captured the greater part of the rebel force under Comandante Nacario Villanueva and Bernabe Magdohos (probably Magbohos). In all, 34 prisoners were rounded up and, with them, 22 serviceable rifles, 4 bolos and 2 daggers. Villanueva was purportedly one of General Miguel Malvar’s men, upon whom the latter had placed so much confidence. The 1st Cavalry under Captain John D. L. Hartman, about 50 men in all, captured four rebels along with their commanding officer, one Captain Lucio Tuncafe. Also captured was one bolo and 5 ponies. The 1st Cavalry under Captain Oscar J. Brown struck a strong rebel force at barrio Ibanga (presumably barrio Jaybanga) at the foot of a mountain. The fighting was fierce and the Americans lost Privates Harry Bechtel and James Kocoureck, who were killed instantly. The rebels seemed “to have an unlimited amount of ammunition.” However, the Filipino rebels also lost heavily. Houses, cuartels (barracks) and a carriage factory were destroyed. A number of rebel ponies were also captured. While on patrol, a detachment commanded by 1st Lt. William F. Fassett of the 21st Infantry killed two and captured another two Filipino rebels in the vicinity of Batangas town. There were no American casualties. One Captain Bunfalidt (obviously an erroneous spelling) of the Filipino rebel forces surrendered in Bauan with 1 serviceable rifle. In Tanauan, rebel forces commanded by Captain Juliano Panganiban, Captain Jorge Perez and Lieutenant Vyronde (Vizconde? ), about 20 enlisted men in all, surrendered near barrio Luyos to Captain Morton F. Smith of the 20th Infantry. The group was part of the force of General Miguel Malvar. The captured rebels took the Oath of Allegiance (to the United States) in Tanauan and were released soon afterwards. In the Taal area, a detachment led by 1st Lt. Walter S. Grant would capture rebel Colonel Martin Cabrera, his adjutant Captain Urbano Ponsalan (likely Punsalan) and 6 other rebels. The Americans regarded this as an important capture because Cabrera “controlled all the insurgents and country in southern Batangas and west of the town of Batangas. 2 Mausers were German-made pistols issued to the German Armed Forces in the late 19th century. Wikipedia. 3 The Krag rifle was a Norwegian designed rifle adopted as standard by the armies of Denmark, the United States and Norway in the 19th century. Wikipedia.